If you have lived in the Colorado Springs area for any amount of time, you know all too well how common severe weather is in our region. In fact, 2018 was one of the worst storm seasons on record for our area with at least three large wind and hail events, one of which caused an estimated $169 million dollars in damage. If you are uncertain how to tell whether or not your roof sustained damage, Go2 Contracting is here to help. We provide hail damage repair in Colorado Springs and the surrounding areas, and we are more than happy to inspect your roof to determine whether or not it has any type of storm damage. Today, we will review three common types of storm damage and why it is best to leave your roof inspection to a professional. Read on to learn more and call us today to get started! Strong winds are not uncommon in our area, especially as the seasons change. We regularly experience chinook winds with gusts that can reach up to 80 mph or higher. This is enough to put even the most resilient shingles to the test, and all too often, the strong gusts get the best of residential and commercial roofs. Missing shingles are a good indication of wind damage, as are loose and misplaced shingles. In order to provide protection against the elements, shingles must be in place and sealed to one another to create a watertight covering. Wind damage is one of the most common types of storm damage. 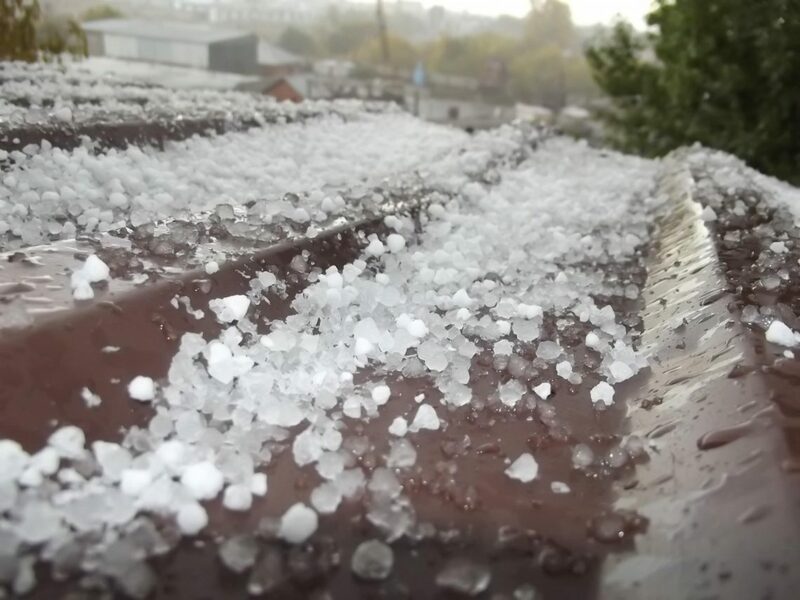 Small, soft hailstones typically don’t have enough force to cause damage to your shingles, but large, hard hailstones can decimate a roof, siding, and gutters in no time. If you notice a large number of granules by your downspouts, indentations on your shingles, or other hail damaged property around your house like cars and patio furniture following a hail storm, it’s probably best to request a professional inspection. Roofers who claim to specialize in storm damage may call you or knock on your door following widespread hail events. However, we encourage you to do your research before hiring a contractor for hail damage repair in Colorado Springs. During severe storms, there is more than hail and wind damage to worry about. Tree limbs snap and can fall on your roof and trampolines can be picked up and blown around. The obvious indication that your roof has been damaged by falling or flying debris is seeing or hearing the debris when it impacts your home. 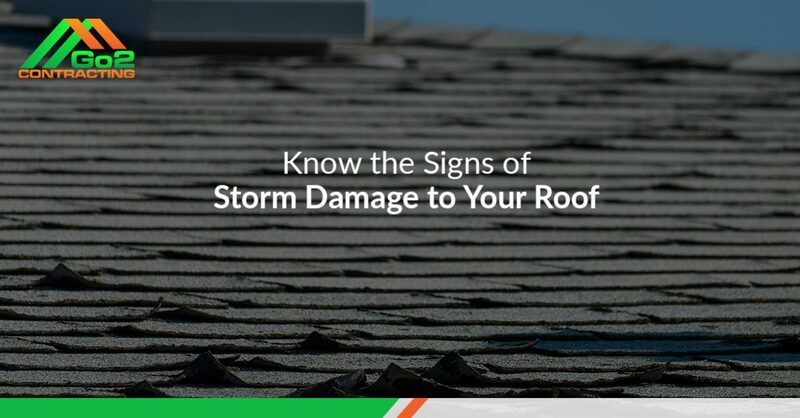 Other indications include seeing debris on your roof, spotting missing, cracked, or broken shingles, and finding large quantities of granules around your downspouts. If you suspect damage to your roof, it is best to have a professional roofing contractor complete an inspection. Thinking about climbing up the ladder and checking out your roof on your own? Here are a few reasons why you should allow Go2 Contracting to inspect your roof. Thorough and accurate inspections. Our experienced roofers know exactly what to look for when they are inspecting your roof, and they are able to spot damage quickly and easily. Proper repairs. If you have damage to your roof that needs to be repaired or replaced, you can rest assured that our roofers will complete the work properly in accordance with local building codes. Safety. The average roof height for a single-story home is 10 to 12 feet. Homes with more than one story can have roofs that are 30 to 40 feet up in the air. Don’t jeopardize your own safety for the sake of saving some money. Cost-savings. Replacing a roof is a complex process that involves many steps. If you make a mistake or buy the wrong materials, you may end up spending more money than you need to in order to remedy the situation. Insurance claim assistance. Our team knows what information and documentation your insurance company needs in order to pay your claim, and we can help streamline your storm damage claim process. Concerned that you have wind or hail damage to your roof? Go2 Contracting provides affordable hail damage repair in Colorado Springs that can restore beauty, functionality, and efficiency to your roofing system. Our Tuff Roof System is designed to meet and exceed local building codes to provide you with a long-lasting roofing solution, and we can also repair or replace any damaged siding and gutters that you have. That means you don’t have to worry about hiring more than one contractor for the job! Ready to request your inspection and free storm damage estimate? Contact our team today to get started and learn about how you can upgrade to impact-resistant shingles for free. We look forward to hearing from you!